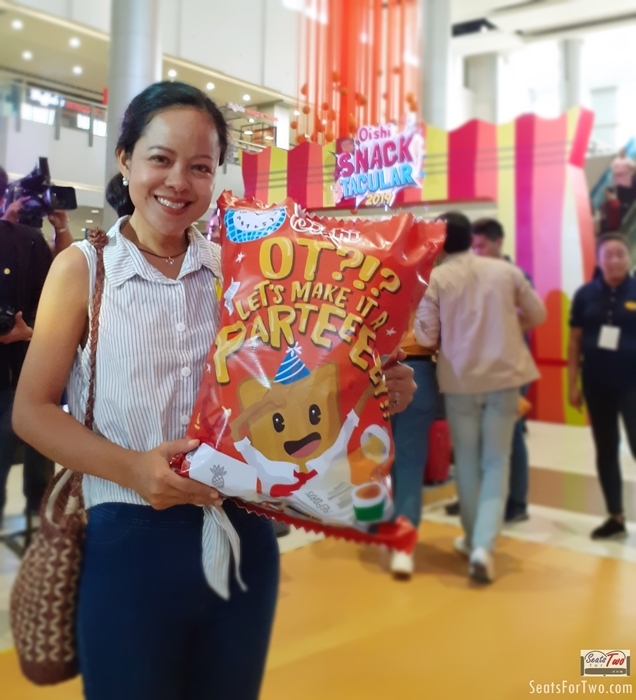 For the first time, Oishi Philippines brought their fun-filled famous Oishi Snacktacular activities north of Metro Manila – to SM City Clark – and treated everyone to tens of thousands of snacks and goodies for 3 days! And of course, Seats For Two didn’t miss this opportunity to join-in on the fun and activities! 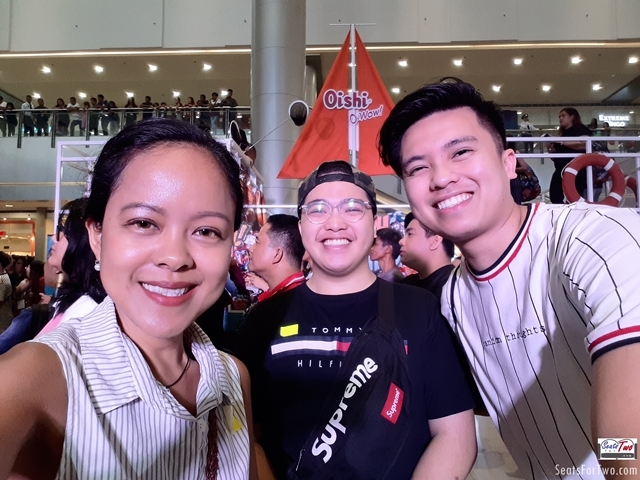 Oishi Snacktacular 2019 @ SM City Clark, Pampanga! 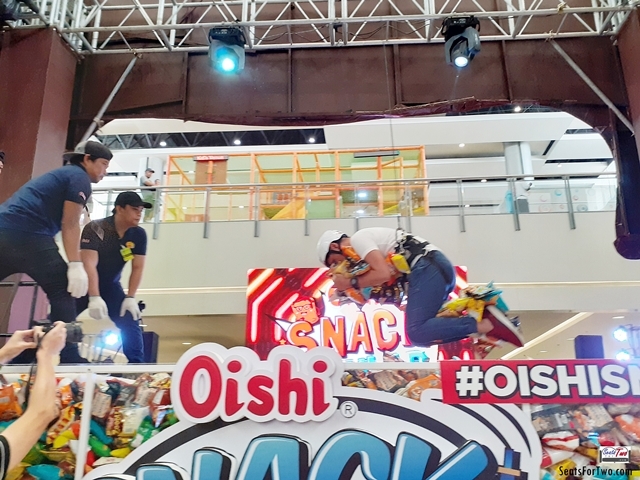 We started the day early in Metro Manila and trooped to SM City Clark in Pampanga just in time for the start of Oishi Snacktacular Day 01 at about 11am last April 5! We saw familiar all-time favorite booths – the Snack Shack and the gigantic and eye-catching Snack Catcher! Mrs. Seats For Two with a bag full of Oishi snacks!! Mr. Seats For Two at the Oishi Snack Catcher! But this year, new exciting activities were also added! One of them is the Fish for Chips booth which literally means you will be fishing for ‘Oishi‘ chips the traditional way – using a small net with a hand-held fishing rod! If you’re fast enough, you can fill a net bag full of Oishi seafood products such as Fishda, Kirei and Oishi’s newest shrimp snack – Shripon, among others. 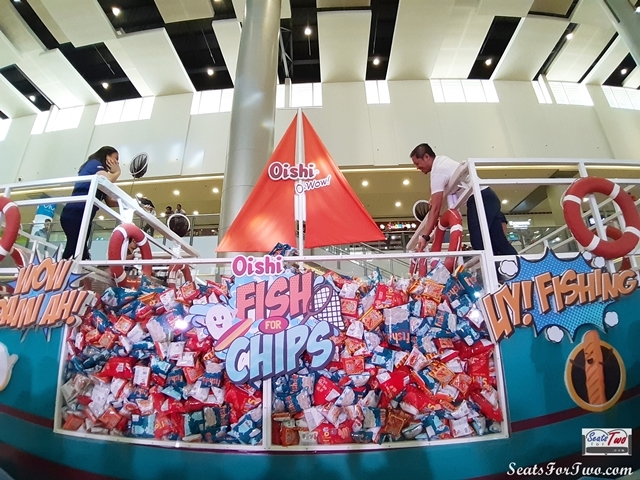 The other new booths include the Shop-Tacular, and Oishi O-Chill! As for the activities that we tried, we started with the Fish for Chips out of curiosity. After which we immediately proceeded to the crowd- favorite – Snack Catcher! This is not new to us as we’ve tried this in the past, yet the excitement remains. Mrs. Seats For Two got only a handful of chips summing to less than 20 pieces while Mr. Seats For Two made sure to triple the number, for a total of 58 chips in one catch! 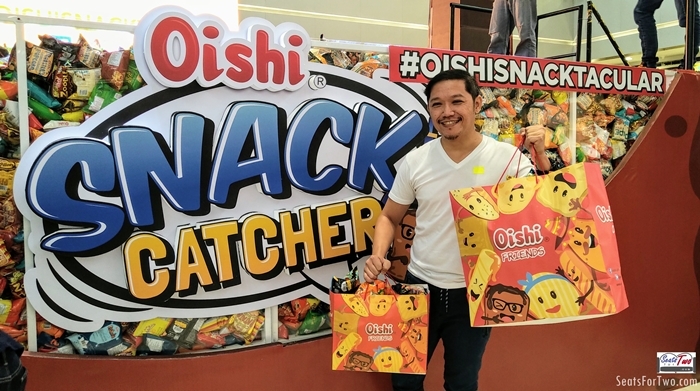 The Oishi Snack Catcher Booth! We are so energetic that day that we went to Snack Shack next! Here, you will be given 1 whole minute to place your favorite snacks inside a 2-feet Oishi bag as if you’re doing groceries. Make sure to fit all your snacks as it has to be sealable. Otherwise, the checkers will have to remove the extra snacks that won’t fit in. This is our all-time favorite. Sadly they did not include our favorite Oishi beverages Oaties and Choco Chugs this year in the grocery picks. After the major booths, the rest was breeze as we proceeded to an Oishi shop booth called Shop-Tacular. This is where customers can buy cute and cuddly Oishi merchandise. 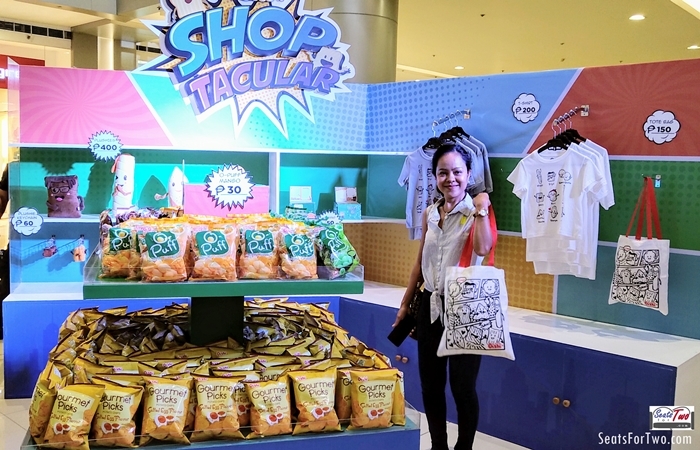 You can choose from among different printed shirts, plush toys & Oishi mascots, and tote bags! And finally, we went to the Oishi O-Chill, well, to ‘chill’ and get some Oishi refreshments. The Oishi van sold refreshing summer drinks made with Smart C lemon, Oishi Oaties and Coffee for only Php 40 for a medium-size cup. We tried the Smart C lemon with Yakult and Oishi Oaties with sweet corn. We loved it as they were both refreshing and great tasting. Aside from fun booths and activities. The crowd were entertained by Oishi ambassadors, Crispy Patata endorser Alex Gonza. 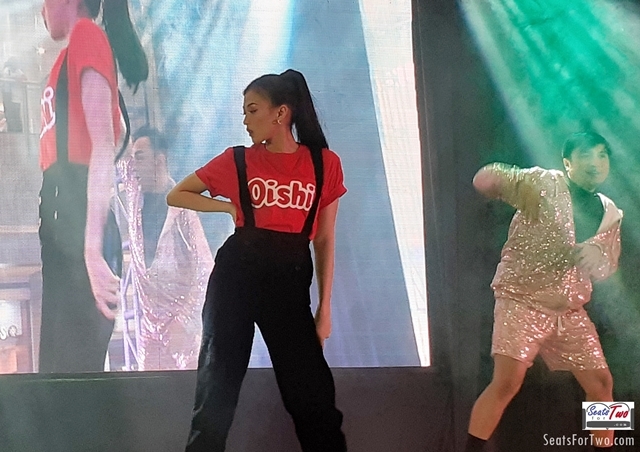 Day 02 was YouTube sensation Janina Vela‘s turn while Donny Pangilinan brought in the crowd earlier today – Sunday. 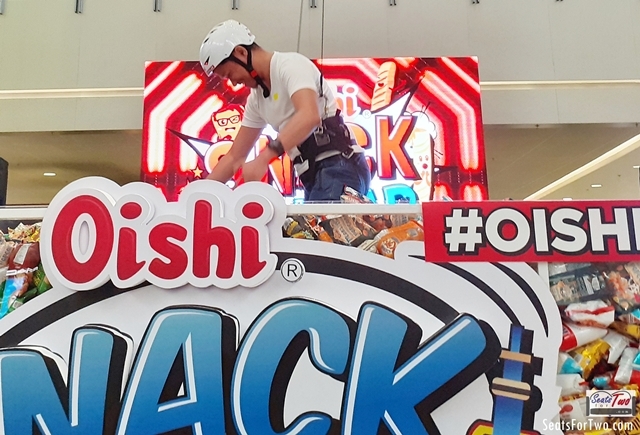 Oishi Snacktacular surely brought back our childhood memories of playing games while munching snacks! 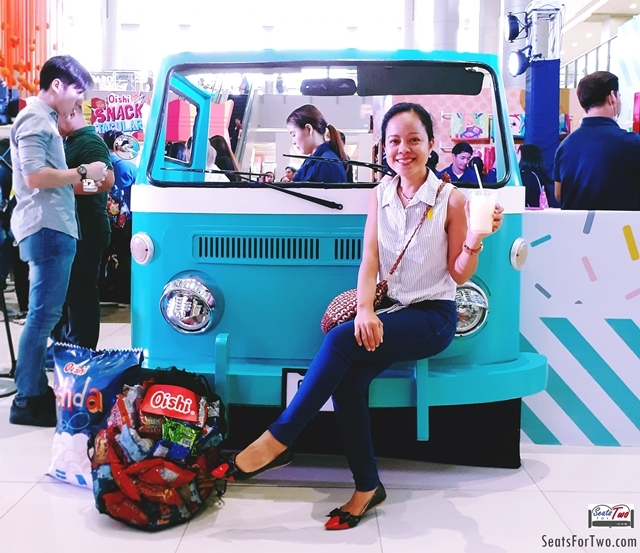 Congratulations to Oishi Snacktacular for bringing together friends and families for a weekend of play and snacking! 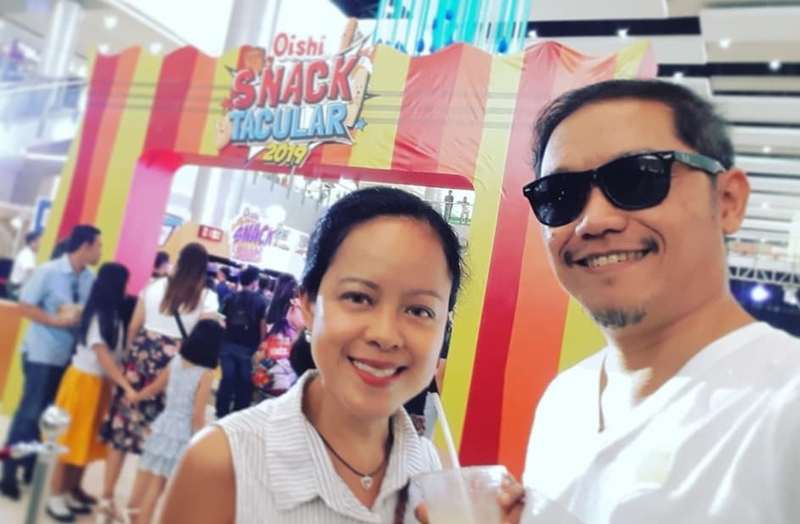 We are looking forward to Oishi Snacktacular 2020! Can you guess where it might probably be?